Aloha Cluster Pays isn’t perfect, but for a tropical island themed slot with plenty of originality, it isn’t far from it. 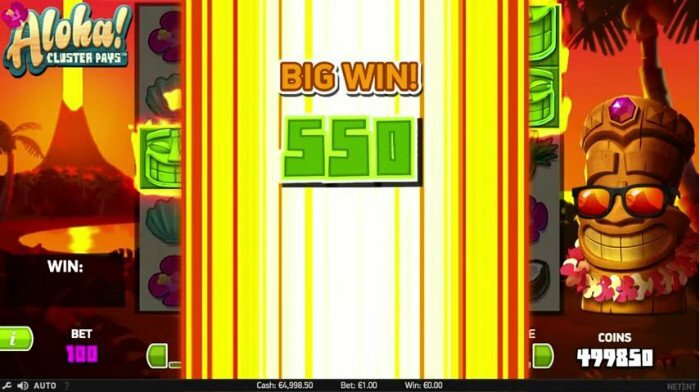 Net Entertainment has broken new ground with their Aloha Cluster Pays slot machine game, which doesn’t really feature paylines on its 6 reels. Never before has a NetEnt developed slot has too many special features, such cheap bets, and yet graphics which are only mediocre. Find out more about how Aloha Cluster Pays compares to other top NetEnt slots, in this, our Aloha Cluster Pays slot review. First up, let’s look at the Aloha Cluster Pays slot graphics. These are not exactly above board. The game’s graphics are actually rather poor, especially for a new slot from a company which usually invest time and effort in producing tip top graphics. Even so, you are tempted to forgive NetEnt for that, given how super the special features are in the Aloha Cluster Pays slot. Net Entertainment will allow you some flexibility with your wagers, but not a great deal. Fortunately, wagers are as cheap as chips in this game. Coin values can be adjusted upwards from 1p up to £2, and players can select betting levels which range from 1 to 10 coins. At its cheapest, this slot will cost you just 10p a spin, whilst at its most expensive it can see you wagering up to £200 a spin. As we have said, there aren’t really any paylines on the 6 reels of this game. Instead, players are required to form “clusters” of symbols, in order to bag wins. When 9 or more symbols are either horizontally or vertically part of clusters, the player picks up a win. A box with a question mark on it acts as a wild. It can replace all other symbols in the game, barring the free spins icon. When a player wins with a cluster, they will automatically trigger a Sticky Re-Spins feature. In this feature, the winning symbols are held in place, and all other symbols re-spin. During a sticky re-spin, the number of winning symbols you have may increase, boost your chances of success. Any win with sticky symbols is followed by another re-spin, and so on and so forth, until you do not win. 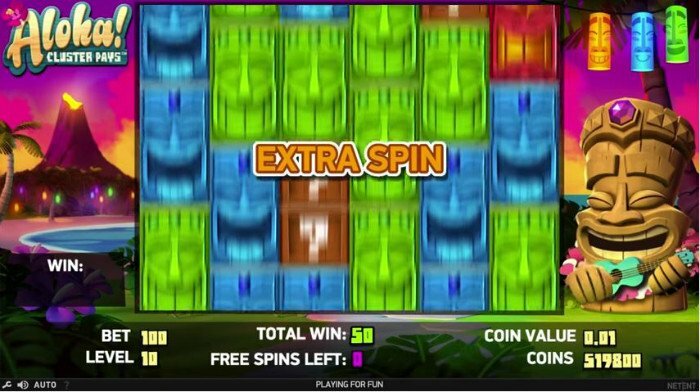 If a player lands 3, 4, 5 or 6 free spin icons anywhere on the reels of the base game, they will pocket 9, 10, 11 or 12 free spins, respectively. Landing 3, 4, 5 or 6 symbols during the free spins game itself will see you land another free spin, 2 spins, 3 spins, or 4 spins, respectively. In the free spins bonus, low paying symbols are usually dropped, meaning that only the best paying symbols stay. This again boosts your chances of a win. This is just one of several really hot Aloha Cluster Pays slot bonuses. There are far more areas where you can complement Aloha Cluster Pays, then where you can criticise it. 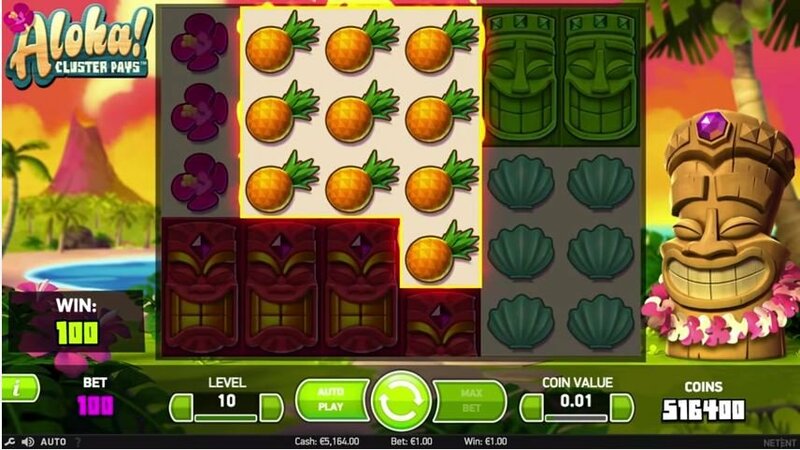 For that reason alone, most NetEnt slot lovers are going to find the Aloha Cluster Pays game a treat. 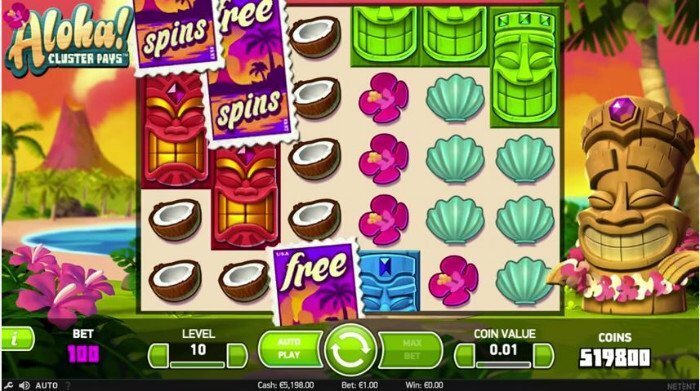 Aloha Cluster Pays isn’t perfect, but for a tropical island themed slot with plenty of originality, it isn’t far from it.